To modern eyes this French-made Hurtu with 8 h.p. De Dion engine is just cute but we take for granted its modern features ahead of their time. 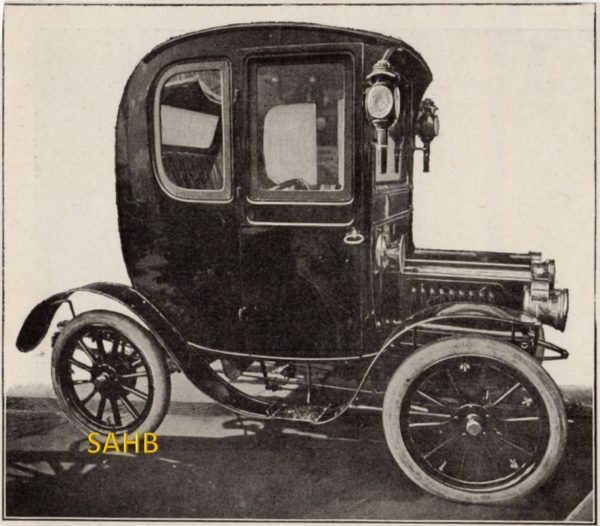 The first thing to note is that this car is early 1905, shown at Olympia in February by agents E. & H. Hora, and yet the fully-rounded compound-curve body could be 1920 when that fashion first became established. The continuous rounded line starts from above the windscreen and sweeps right around the body to end in a brougham point (mirroring this feature above the screen) at the bottom. The generous backlight window is also notably modern and not many cars in this period were fully enclosed. This 3/4 coupé body itself was promoted as “a doctor’s car” in the press and from this point onwards until around 1930 the 3/4 coupé type was regularly called a doctor’s coupé (although mainly with folding top). 3/4 refers to the side window behind the doors. Presumably doctors were out in all weathers and needed comfortable driving conditions as well as good vision all round the car. In this instance it’s hard to believe the driver’s door would have been used given the steering column and lever obstruction. On the other hand, if a doctor was chauffeured to his home visits then this impediment would not have been an issue. The coachwork too is French, by Lamplugh of Paris. This company made a variant of this body for the Hurtu with the body cut away under the seat (adjacent to the wings), and a normal joint line at top rear to meet the roof, both being standard practice at this time. Presumably it was feared some customers would not buy the much smoother and modern style shown here. Plus ça change…. The car does not appear to have a near side rear wheel, but I suppose it must have! If you look at the rear edge of the car, the printer has done a fairly scruffy crop of the background – so he’s clearly lost the nearside rear wheel in the process! The joys of Photoshop version 1900!